There are a few things that we should do every day, the most important is thanking God for allowing you to see another day. For our physical body, we brush our teeth, shower, and eat well; for our spiritual well-being, we should communicate with God through prayer and meditation, we read the Word and fast. It’s very easy to tell when you haven’t washed in a few days. There is no denying the aroma of B.O. If we miss breakfast our bellies growl and grumble reminding us it’s time for nutrition. God in His infinite wisdom, has given our bodies ways to alert us when there’s a need to take care of, but what about our spiritual lives? What happens when we don’t make time to be alone with God? What did He give us to alert us when our spiritual well-being is in need of attention? When I’m in trouble and I can’t see a way out, I know I can go to Jesus and ask Him to help me through. He brings me out of my trials every time. As a believer, I know that I can seek Jesus through prayer and build my faith by meditating on the other times of trouble He’d brought me through. What about the times when we’re not seeking comfort, protection, guidance, direction, fixing, healing, or deliverance? I’m talking about good times, or the okay times, or the my-life-is-finally-getting-back-on-track times–the times in our lives when we forget that we still need Jesus. The times when we’re too busy to make time to pray–not to ask for anything in particular, but to remind God that we still need His grace and mercy; that we are sinners and need His forgiveness, but above all else, just to thank Him for being who He is in our lives. We forget about all the troubles and all the despair that we’ve experience during the turbulent times. We forget the jubilation we felt when we realized God had finally fixed the situation, despite all that was stack against us. We shouted, we praised God in our hearts, in our heads, or maybe even, openly because we could care less if anyone was looking. Our God showed up! BOO-YAH!! In the good times, we forget Jesus and all that He’s done for all of us. You want to pray every day, you want to read the Word every day, you want to praise Him every day. Easier said than done, I know. Life happens. Things come up–work, kids, dates, girls’ night out, football Sunday, dance practice, hockey try-outs, the list can go on and on. I’m not going to pretend to have a secret algorithm that’s going to tell you the amount of time you should spend getting closer to Jesus, but I don’t need complicated math and complex science to tell you it’s something that you should find a way to work into our schedule. The amount of time you spend getting to know God, is between you and Him; what you says and how they say it is your business. Don’t say anything, if youc can’t find the right words because God knows your heart, just use you quiet time to reflect on His goodness and kindness. Our spiritual well-being, as Christians, requires us to give God the attention He deserves. As with the physical body, our spirit needs nutrition, it needs something to sustain it, or it will break down, cease to exist. The Word is the supplement God has given us to feed our spiritual selves. Prayer, meditation, and praise are all good for our spiritual well-being, like meat and potatoes, rice and beans with some baked macaroni and cabbage on the side and a tall, cold glass of iced tea. Excuse me, I think I salivated on myself. The Word is water, not as flavorful as meat, but more important. Without water, our physical bodies couldn’t survive. Water sustains our physical bodies. The Word sustains our spiritual bodies and helps when it comes time to pray and praise Him. Stop feasting on the Word and we will not survive spiritually. Dying spiritually is tough. Not something I want to go through again. I am guilty of not taking the time out to get closer to Jesus. I’m trying to do better every day. I had set aside time to rejuvenate my spiritual welling-being for the new year, but as with all New Year resolutions, that went down the drain rather quick. I’m trying to find the time that works best for me. I don’t need a lot of time, I’m thinking 30 minutes in the morning before the kids get up on weekdays and mid-afternoons on Saturdays and on the Sundays if I don’t go to church. I have some resources that I use for my daily readings, I think I’ll share in a separate post. They are great resources for daily devotional and catalyst for that day’s prayer and bible reading. I am at a point in my life where I want to be closer to Jesus. 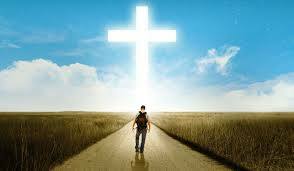 I want to take up my cross and follow Him. What about you, are you ready for a healthier spiritual lifestyle? How are you going to get closer to Jesus?